The giant green monstrosity is back again in another adventure to earn you massive cash jackpots! Click here to play! The Hulk is looking for things to smash and has enlisted your help in an effort to achieve this goal. 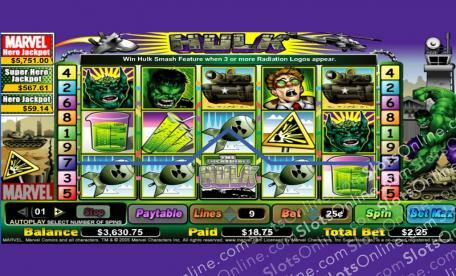 The Hulk is a brilliant 5-reel slot played across 9 pay lines, with the more lines activated multiplying your payout odds. The Radiation symbol is Scattered and will trigger the bonus feature when three or more appear at any one time. Once inside the Bonus Game, the Hulk must smash his way to lucrative winnings. The Incredible Hulk logo is the Substitute and can become any other symbol on the reels except Scatters. Additionally, any winning combination that the Substitute is involved in will immediately double the cash payouts. Help the Hulk smash up the secret weapons laboratory � and some bad guys in the process � for your chance at incredible winnings! The Radiation symbol is Scattered and will earn you up to 100 times your initial wager, as well as sending you to the Bonus Round when three or more appear. The Incredible Hulk logo can be substituted for any other symbol on the reels except Scatters and doubles all winnings when in a combination with a qualifying combo. Three Scattered Radiation symbols will send you to the Bonus Round where you must smash the secret laboratory for cash.